The Eagle's magical season continued this afternoon, as they earned an exciting 3-2 overtime result in the NCCAA II North Central Regional Championship game to punch their ticket to the National Tournament in Florida. Faith used solid defending and timely attacks to earn the come from behind victory after trailing early 1-0. The Eagles stand at 15-2-1 on the year. Providence created dangerous attacks throughout the match, catching the Eagles off guard early in the match with a nice cross that was headed in for a quick 1-0 deficit for Faith just 10 minutes into the game. Faith settled in defensively and began to apply some pressure of their own. In the 36th minute, Providence played the ball back to their keeper and the Eagles Marcos Loveall applied pressure. Loveall's pressure paid off, as he was able to get to the keeper just as he was attempting to send the ball downfield. The resulting deflection ended up in the back of the net to pull the Eagles even at one a piece. That score held going into the half. For the first 25 minutes of the second half, neither team was able to break the tie, but Chase Clark who played limited minutes in the game as he continues to recover from an ankle injury, was able to get in behind the Pilot's defense off an assist from Cole Glanzer and chip the ball over the keeper to give Faith the lead. Providence responded with their own pressure and the pressure paid off, as Providence earned a foul in the box to earn a penalty kick. Region MVP Mitchell Martens stepped to the line for Providence and delivered the equalizer. Neither team could find a game winner in regulation and the game headed to a golden goal overtime. Both teams came out motivated to start the overtime, and Faith quickly worked down the field to earn a corner kick. Joseph Frerichs took the kick, and off a perfect ball found Nick Paine for the header perfectly played into the upper 90 to give the Eagles the win. 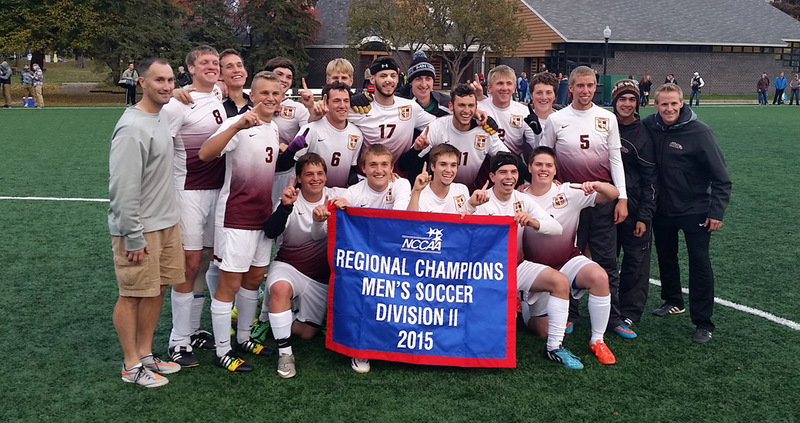 The win earns the Eagles an automatic bid to the NCCAA II National Championship in Kissimmee, FL. Seeding and game times will be announced Sunday or Monday for the November 11-14 tournament. Details for the tournament including live broadcasts of the games can be found on the NCCAA's website.